Baltimore's Renato Nunez about to touch the plate on his first inning home run, with Yankees pitcher J.A. Happ looking on. Photo by Jason Schott. The Baltimore Orioles jumped out to an early lead against Yankees starter J.A. Happ and, despite a furious Yankee comeback, held on for a 7-5 win on Sunday night to take two of three in the opening weekend series. This game was delayed three hours and 17 minutes by rain, and it turned into a nice late afternoon-evening matchup that turned into a three hour-48 minute battle. Happ started off the game with a strikeout of Jonathan Villar, but then he allowed a rocket to the gap in right field to Dwight Smith, Jr., for a double. Trey Mancini then reached on a dribbler down the third-base line. Baltimore's designated hitter Renato Nunez was up next and he hit a bomb to left field for a three-run homer to give them an early lead. In the third, Mancini hit a rocket of his own to deep center field to make it 4-0 Orioles. In the bottom of the third, the Yankees got something going against Baltimore starter Dylan Bundy, as Gleyber Torres doubles, DJ LeMahieu walked, and Giancarlo Stanton walked to load the bases with two outs. Luke Voit was up next, and he struck out to end the threat. The Yankees threatened again in the fourth, as Miguel Andujar singled, and Greg Bird and LeMahieu walked to load the bases again with two outs. Bundy hit 93 pitches with the LeMahieu walk, so that was all for him, and Baltimore turned to lefty John Means to take on left-handed hitting Brett Gardner. After a battle that saw Gardner work the count full and foul off plenty of pitches, he earned a walk to force in a run. Judge followed with a rocket single to bring in two more and make it 4-3 before Giancarlo Stanton struck out on three pitches to end the inning. Happ did not come back for the fifth inning, and his final line was: 4 innings pitched, 4 runs, 5 hits, 3 strikeouts, 1 walk, and 2 homers, 75 pitches/50 strikes. This was not the debut for 2019 that the Yankees envisioned from a guy they relied on down the stretch last season. The Yankees turned to Luis Cessa, who is looking to improve after a rough 2018. Cessa opened the fifth with a strikeout of Richie Martin, then allowed a single to Villar, who stole second and reached third on a throwing error by Yankee catcher Gary Sanchez. Smith, Jr., then lined one past Yankee shortstop Gleyber Torres, who along with the rest of the infield, was drawn in, and that made it 5-3 O's. Cessa kept it right there, and Sanchez got that run back in the seventh when he launched a solo home run down the line in left field. In the top of the eighth, Cessa struck out Mancini looking and walked Nunez before he was lifted for left-hander Stephen Tarpley, who was making his 2019 debut. Tarpley, who won the James P. Dawson Award for best rookie in Yankees spring training, got Rio Ruiz to ground back to him for the second out of the eighth. 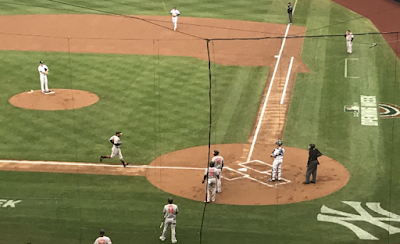 Joey Rickard was up next and hit what looked like a routine fly to right field that the wind carried into the seats for a two-run homer to open up a 7-4 lead for the Orioles. Yankees Manager Aaron Boone said of Tarpley pitching to the right-handed-hitting Rickard instead of walking him to get to lefty-hitting Chris Davis, "No, we are all right with that matchup." Means, who held the Yankees at bay until that point, would not come back for the eighth, as they turned to a pitcher they view as their closer, Mychal Givens. Torres opened the eighth by grounding out, and then LeMahieu was hit by a pitch. Gardner followed that by grounding one back to Givens, who threw wide of second base trying to force out LeMahieu, so the Yankees had two on base with one out. Judge then struck out, but LeMahieu and Gardner advanced on a wild pitch on strike three. Stanton then walked to once again load the bases. Voit grounded out to end the inning, the second time he failed to deliver with the bases jammed. The Yankees turned to Tommy Kahnle in the ninth, and he walked Martin, Villar, and Smith, Jr., in succession to load the bases with none out. The right-hander then recovered to strike out Mancini, get Nunez to ground out to Bird, who forced Martin out at home; and struck out Ruiz to get out of it and keep it a 7-4 game. Givens came back out for the ninth for the Orioles, and the Yankees would not go quietly into the night. After retiring Andujar and Sanchez, he walked Bird and allowed a single to deep short to Torres, who beat out the throw in a photo finish at first base that Baltimore challenged before it was upheld. LeMahieu then singled home Bird to make it 7-5, and that was all for Givens. Baltimore turned to left-hander Paul Fry for Gardner, but the Yankees countered by sending up Troy Tulowitzki as a pinch-hitter. Looking to duplicate what he did Saturday, when he homered amidst another Yankee comeback in the ninth, Tulowitzki would not be as lucky, as he struck out to end the long day at The Stadium. The Yankees had plenty of chances, but could not get the big hit, as they were 2-for-12 with runners in scoring position and left 14 runners on base. Means earned the win for Baltimore, as he went 3 1/3 innings, allowing 1 run on 5 hits, with 5 strikeouts and a walk. Baltimore Manager Brandon Hyde, in his first year at the helm, said of winning two of three at Yankee Stadium to open the campaign, "Well, I just think this is how you grow as a team, honestly, playing games like this, series in these environments against really good clubs, and to have guys step up. When somebody gets into trouble, have the next guy come in and help out. I just thought we did a great job of that this series. "John Means today, that was just enormous for us, to eat the innings that he ate, you know we're already short (after he used five relievers to cover Saturday's win using Nate Karns as an "opener"), and for those guys to be able to put together nine innings is impressive." On what his locker room felt like to come out with a series win, especially after such a grueling day, Hyde said, "I mean, it's three games of 162, but I think that it's great to get off to a good start, it's great to play with the energy that we're playing with. I love the feeling in our clubhouse. I thought our guys stayed engaged during the delay and wanted to play. I give a lot of credit to our guys for hanging in there today." Boone said of losing two of three to the Orioles and addressed the expectations that they were supposed to clean up this weekend, "I am not in the projection business, first off all. I reject that all the way. We have no idea who people are. We have high expectations for ourselves. The bottom line is we think we are going to be a really good team. You are going to have series where you don't put your best foot forward. I am confident we are really close to doing that and we plan on that starting (Monday) night," which is when the Yankees start a three-game series with the Detroit Tigers at Yankee Stadium.